Rhinox TV - Episode 3 - Rhinox Quick Hitch! In Epsiode 3 of Rhinox TV, Will Hooper and Warren Palmer talk about some of the key features of the Rhinox Quick-Hitch! Watch below as they discuss how easy it is to attach the mini digger hitch to a mini excavator, and how easy it is to use the hitch to attach a grading bucket or digger bucket! Buy The Rhinox Quick Hitch Online! 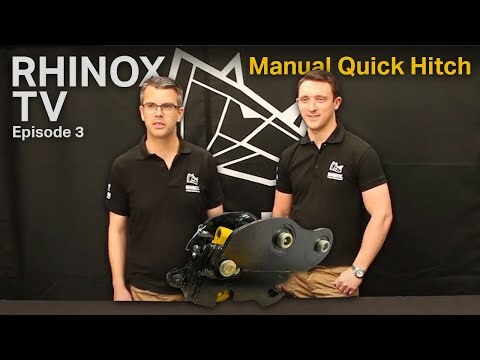 Welcome to Rhinox TV – Episode 3, we’re here today to talk about the Rhinox quick hitch to suit micro to 3 ton excavators. Will, can you go over some of the features of this new Rhinox quick hitch? Well, the hitch itself has a number of features, but if I start here at the safety pin, as you can see we’ve got a lynch pin on a steel cord, so it can’t be lost. But then the safety pins itself has a captive feature, so that when it is pulled out, the pin can’t come out from the quick hitch. That’s a very useful feature, that’s a common problem on site, that gets lost and then you can’t use it! Exactly! So when you put that back in, the lynch pin is right on hand, so that you can push it back through there, and that secures the pin so that the hitch itself is secured on to the bucket. The overall design of the hitch is squat, and low profile, and that increases the tear out force on the digging bucket once it is attached to the machine, because the further out that goes, that reduces the tear out force on the bucket. We’ve also got, as you can see, manuals and stickers that go with the quick hitch. Right okay, and that all comes as part of a package does it? Yes, that’s exactly right, there’s a box which includes the hitch, all the spare parts, and then the manual. And at the back of the manual, you’ve got a fully printed inspection record. And then at the front you can put down what part number and serial number the hitch is, so you know what this manual relates to. Where will you find that on the quick hitch; the serial number? Well that’s printed here on the badge that shows its CE marked, and that’s got the serial number and the part number there, printed and engraved into the badge so it can’t be removed very easily. And then you’ve got stickers, clearly printed up on how to attach the hitch to the machine, and the bucket to the hitch. And that’s to put inside the excavator. And then another sticker to go on the outside (Dipper Arm). And then you have got a CE declaration that all comes together in a plastic wallet, so that’s all ready when you need it. What we have also got with the hitch is it is made from hardened steel, it’s not just mild steels, so it doesn’t wear out very easily. And you can see here, its got a piece between the 2 hooks, so that keeps it solid and together, and it can’t bend apart, so it is always going to fit to your bucket when you need it to! I noticed this bit is yellow, is that a special feature or? Its just for visibility, so you can see whether the latch is open or closed, it’s a heavy duty latch, and its got a heavy duty spring as well, so its tensioned well, so it doesn’t flop around, and come loose easily. What you have also got is a solid handle that comes with the hitch. That’s been a big complaint for people in the industry, is that the handle can bend, which is not what you want really when you are trying to put a bucket onto the excavator! It’s got a rubber grip as well, and its got a captive eye so it doesn’t slide right through that latch, its just slots in and gives a good leverage point. You’ve also got shims that come with the hitch package, so that you can shim it out to give it a good fit. To make it nice and tight! Exactly right, you don’t want something that is going to shake around and increase the wear! What about spares, I mean sometimes that a problem, you need spares the next day if you lose something? Yeah, we’ve got a full supply of spare parts, including the pins at the top, which are securely bolted in, as you can see. So that they can’t come loose. Some people have lynch pins in there hitches, well we don’t think that is a good idea, because they could come out, and then those pins could come out of the machine and then the hitch could drop off right when you don’t want it to and that’s a major hazard. So yes, all the spare parts are stocked, and we’ve got those ready for next day deliver when you need them! Good, can you show me this being fitted to a bucket? That’s absolutely fine, well if we get a Rhinox bucket in, then we can show you how that fits on, and clicks in very easily! Now, we’ve got a Rhinox bucket here that is compatible with this 1.5ton Rhinox hitch, this works with many of the Kubota and JCB models, for the 1 and a half ton range! As you can see, we can fit it on top of the bucket here, then we remove the lynch pin, and then the safety pin can slide out, which is captive as we’ve discussed before. We get the handle, and pull that down – and then that’s in place firmly, and we can push the safety pin back in firmly, and put the lynch pin in, which makes that safe. So that’s how you fit a Rhinox quick-hitch on a Rhinox Bucket! Wow, that’s very neat! I’m really impressed with that. Thanks very much for showing me that will, and thanks for listening to episode 3 of Rhinox TV.